That's presuming that we're all on the same planet and besides I could make the argument that it's much easier to run get power for the truck or rover. With power on the backpack at least I'd be able to see where I'm going. Since the new patch on Xbox one, i cant use certain items. ie...oxygen tank and some purple item that looks like organic. Both items says" item description ". Why is there no 4k support on PC? I just tried it and it does not work. Render resolution is 1920x1080 no matter what I try. It's quite poor considering that the Xbox One X received 4k support recently. That would be a very resource hungry render. The lag caused would be horrendous. Pure nonsense. We live in 2017, 4k support is standard nowadays. You should wake up and realize that even a slower console received 4k support. 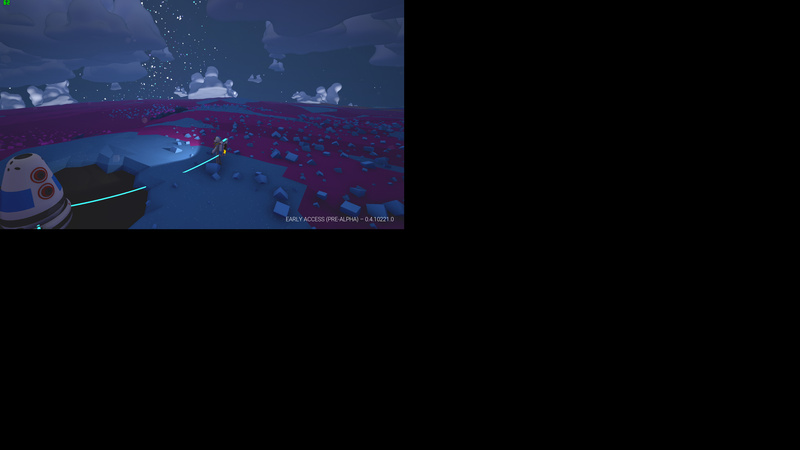 On a GTX 1080 Astroneer is a joke, this game runs CPU bottlenecked. You are thinking of fully released games and video. Astroneer isn't even close to being optimized. But go ahead and think whatever you want. Even worse, you are thinking 4k would cause a horrendous lag which is pure nonsense and nothing more than a poor excuse. You don't even know what system I'm running on. A higher render resolution wouldn't add any more load to the CPU and my GTX 1080 is sleeping in Astroneer. 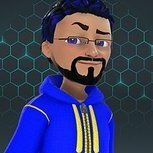 You are either clueless or a biased Astroneer shill, give it a rest. For some people it's too much to ask for why Astroneer on PC didn't get 4K support in contrast to a weaker console. Maybe PC isn't top priority for them, possible yes. After almost 1 year on Steam we have to ask for some more content and render improvements at some point. You seem to be a very angry and volatile person. You should calm down a bit. Can you not have a discussion without resorting to insults? Like I said, you will think what you want to think. I know that when I run certain games in 1080 I'll get 60+ fps and when I switch the resolution to 4k it drops to 30 - 40. 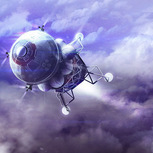 It all depends on the physics system the game is based on and if the code has been optimized. Hardware means little if the software isn't optimized. Then you also have to consider whether the video code has been optimized for Nvidia or AMD. I dropped $2k building my current rig, doesn't mean every game is going to run perfectly. 4K actually should work just fine on PC (I've seen people using it months ago). It's more an issue with the configs and the game not properly recognizing it. Check the config folders (in the game as well as the appdata folder), change the value manually and lock the config. This may work. Xbox One X 4K support is mostly just an update that lets the user use 4K, since consoles are otherwise limited to what settings they have been given by the developers. My Rzyen 1700 and my 1080 Ti is sleeping while playing Astroneer, the FPS eventually drop anyway, though. And that's just 1080p. It's more a matter of optimization. If you play a few hours, your FPS will take a huge hit no matter what settings. Though it's not unlikely it's going to be earlier the higher the settings are...also a higher resolution can (mind, can) actually slightly increase the load on the CPU. 4K simply means the GPU becomes the bottleneck (that's the general rule, of course). Also please do calm down. This is Early Access, so being aggressive because of things that are not even finished yet is absolutely inappropriate. We all deal with the same issues. Anybody else having problems with tethers? I accidentally dug under one of mine & replaced it & all tethers stopped working. Even tried making a new set of them & still broken. When reporting a problem like this it is helpful for the devs if you can include your system information such as xbox, windows 10, steam, if a PC what are the specs, etc. Is your system not being able to select 4k, or at 4k it still runs at 1080p ? On my system I can go up to 4k but do not really see any real difference in quality. I'll delete this tomorrow, ( in about 8 hours). 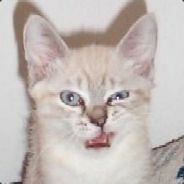 Regardless, I excitedly await the patch notes and the rumored December update! I'm on Xbox One too and am playing on Patch 223 as well. Only thing I've noticed so far is that the Oxygen Tank issue has been fixed. Making one no longer crashes my game and it works as it should, refilling from bases, vehicles and tethers. 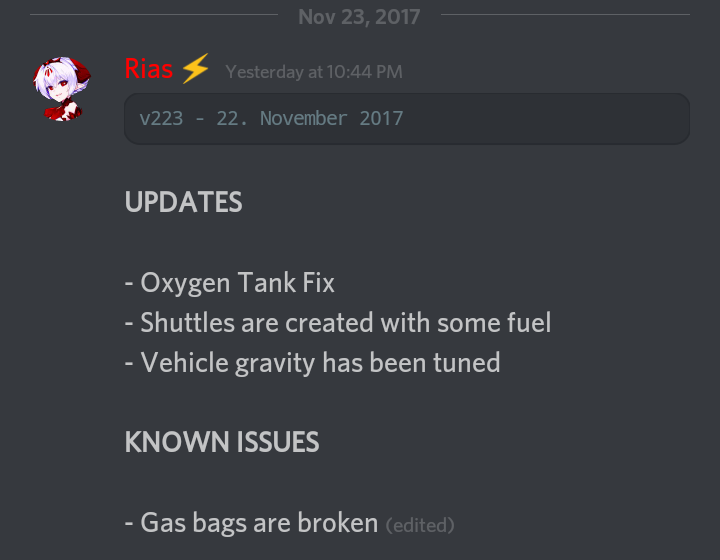 Its a minor hotfix mainly for fixing o2 tank. A sub-product though is the non-deadly gasbags/spacepumkins. Mind those are the notes I directly took from what Joe told us. Right. Sorry. I'm on Xbox One. I have a problem with tethers atm. Just tried using them again but i place them and they stay dark and dont go blue (active like they used too). I am Running Windows 10 patch 223. Seems odd but is definitely troublesome but not the end of the world stuff. just want to make my life easy. If i stand at the end of them nothing as if they not connected to anything. Ok just to update, its as if my Lander is no longer connected to my base. The tethers work from launcher but not from the base. I broke it dont know how but i must of. All in all 4k is not supported for PC unlike console which is a poor treatment for us PC users. Based on this PC users are not that important for them unlike console. Having trouble with tethers too, though it's a different issue. Was hosting a two player game, and after reaching Radiated the other player started having issues with their tethers. When they went to pick them up to reposition them, the tethers vanished through the ground. Was unable to locate them, even after digging into a tunnel underneath them. We both also had the previously mentioned issue of tethers that stopped working, though that was happening before we left Terrain. Is the dynamite fixed again? It didnt work after last update. It blew a hole in the ground but couldnt destroy base modules or rocks or steam vents etc. In previous versions of the game, the ore resources on the planet, always had their name shown above the place where the ore is, but now i dont see the names above the ore resources anymore. Is this a setting or unlockable? or am i doing something wrong? Not doing anything wrong, this hotfix seems to have included a few "issues" of its own, but that often happens (it's even mentioned on the screen when you launch Astroneer). Most aren't too bad, just minor niggles I'd say, I've been playing since late Jan. They always get stuff resolve, I would imagine since nothing (afaik, but of course I don't know about every little bug maybe not even all the big ones lol) there won't be another hotfix until the next update comes later this month, which has been hyped to be a pretty big content update and I think everyone is pretty excited about it (I know I am!)? I'm sure they'll address as many bug fixes as they can at that time. No game is ever 100% bug-proof, as long as things aren't game-breaking the Devs are quite good at getting stuff fixed? I have noticed this issue to though, on Xbox One where I play. I often run the Inhibitor so I don't have to dig holes everywhere especially near my base. I always cover them over if they're nearby because I don't want to fall in them or have a vehicle meet a similar fate. Still blotches of ugly grey terrain nearby don't look good, and it's too much effort (for as long as a game save file typically lasts me) to go around and try and paint each one either a color matching the terrain or something that looks decent. However, sometimes I need a material, whether compound, resin, ore precursors or ammonium, and I'd like to know where they still are if I've run over them with the Inhibitor. Up until last hotfix I guess, running the Inhibitor didn't remove the resource tag above it's location, and that was incredibly handy for my use. So I do hope this is one of those things that won't be too hard to fix, hut you never know really. I remember one time Wyvyrias (hope I spelled that right, lol) posted a great gif about coding and squashing bugs. It showed a person trying to hit one of 5 switches to turn "off" a bug, and each time, another one would light back up. Everytime you made a choice to kill a bug, another one popped back on. I suspect it hits pretty close to the mark when it comes to debugging programs esp games. Too bad it can't all be fun for them, right? They have to actually work at making the game (although I know they must enjoy it, and often when people really love what they do they often say it's really doesn't "feel" like work at all), but still there's deadlines and keeping the company running etc. Lots of not-directly "having fun making game" related business stuff. Pretty much always is some of that, no matter what you do. At least we get to enjoy the fruits of their labors, and early at that! -when retrieving a pack from your deceased location, items are sideways (ones that aren't circular that is). Basically tethers, ore blocks, anything that has a rectangular dimension (normally items appear with the longest dimension along the horizontal, but when you recover them, they now have the shortest dimension along the horizontal or x axis in your pack. I hope that makes sense, I don't have an account with which to share my images, sorry. -as others have reported, also when retrieving your items from a deceased location, one item invariably is stuck partially in the ground. This makes the process of retrieval even more time-consuming esp when you're running low on oxygen, so it'd be amazing if that could be fixed. One time I got caught by a storm just as I was about to enter my habitat, and I ended up with a piece of resin permanently stuck in the black "support terrain" for the base. Luckily it wasn't an important item. If it had been something difficult to fine, I would NOT have been happy? This isn't a new bug, it's been around a LONG time, but I feel it's way past due to be addressed. When you try to pick up an item and your pack inventory is full, the game puts the item in a very awkward "state" You no longer can just select by proximity (via the blue circle highlight, or another color if playing co-op it would be whatever color your player is etc) because the game now treats that object like something completely different, idk how else to describe it. Unless you move the cursor over it (I'm on Xbox One, so believe me it's much more of a pain in the behind for those of us using gamepads to manage a lot of the in-game controls involving the cursor than I suspect it is for PC players, because not only do we not have shortcuts and keybinds, we also lack the ability to continually access and control the cursor, at least, not the way one can do with kb/m. I'm not sure about sensitivity, but from videos I've watched of those playing on PC, it still seems like terrain tool control is easier/superior to that using a gamepad but I must admit the SES team has done an amazing job making the tool feel much more responsive and accurate than it was when I started out! It used to be a nightmare, it's much smoother now and really becomes a problem only when the game is lagging). What I believe "should" be happening when your inventory is full, is the item should return to the location it started from, i.e. the ground, a machine, etc, basically wherever it existed prior to your attempt to grab it. In fact, I'm not sure why the game attempts to perform the animation at all of pulling the item into your backpack when in theory the game should already "know" you pack is full, right? I don't know much about games & programming, but that's what makes sense to me. Shouldn't the "inventory full!" sound and visual alert pop up immediately upon selecting it? It's almost as if the game acts "dumb" (not as an insulting kind of dumb, I mean as in a "not aware of something" machine type of dumb, again hope that makes sense) and has no idea what your inventory count is until you pick up and object and it "attempts" to put it in your pack. When it realizes you don't have enough room, it can't figure out what to do so the item changes "state" it doesn't go back to where it came from, it doesn't fall to the ground (if appropriate) and the worst thing of all is, the item is no longer highlighted by the colored interaction ring which allows you to otherwise quick select & pick up things. It doesn't sound like much of an issue, but I play a lot and this is happening quite frequently, so after awhile believe be it does get very frustrating. I'm sure this wasn't the intended behavior either, because it just doesn't really make sense. Thats probably enough for now most other things I can recall right now, others have mentioned. Like how if you're trying to craft something, the resource in the bottom row you use to print in the pack, won't be withdrawn automatically anymore. Think that's new to the hotfix but also have seen people are aware. Looking forward to the big update! P.S. We just got a Switch, love it although I've only messed around with it a little bit not really sat down to play through Zelda yet but looking forward to that. I'm hoping once Astroneer gets fully launched and has been out a bit, gets recognized etc, maybe there will be some consideration brining it to the Switch? I know there's no way to answer something like this right now, it's only something to keep in mind, consider perhaps. The screen for the portable alone is quite generous I think, I don't think it's too small to play a game like Astroneer on. And then there's the docked TV view, which is as big as your TV. What I don't know, is about the internet connectivity, that might not work out. The Switch is designed around the idea that people playing it won't always have constant internet connection, so yeah that might not work at all. I just don't know. But it's just an idea that's all, no worries if it can't happen it would be quite awhile in the future and down the road so to speak even if it were possible for it to be considered. Thanks!